I’ve been back from China for more than two weeks – and yet the visit is still on my mind. Why? Of course there were many impressions in a short time. That’s not surprising when the agenda starts every morning with the entry „6:15 a.m. Departure at the hotel“. No, in this densely packed program of the delegation trip under the direction of the Baden-Wuerttemberg Minister of Economic Affairs, Dr. Nicole Hoffmeister-Kraut, there was really no room for more. 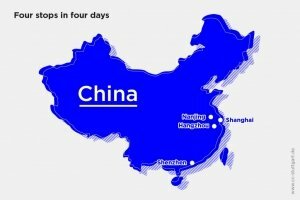 Four Chinese cities in four days. And we were actually only travelling in the South East: Nanjing, Hangzhou, Shanghai, Shenzhen. The economic delegation travelled from the Nanjing arrival point through southeast-ern China. First by express train to Hangzhou and on to Shanghai, then by plane to Shenzhen. Finally we took the ferry to Hong Kong, where the return flight took off.